You can search for individuals and marriages in many different ways. Detailed Searching can get very specific about what you are looking for and you can combine multiple searches together. The Detailed Search form allows you to search for individuals using much stricter criteria. You can use AND and OR modifiers and look for specific types of individuals in specific places. Searches can be refined over and over again to get the specific group you are looking for. 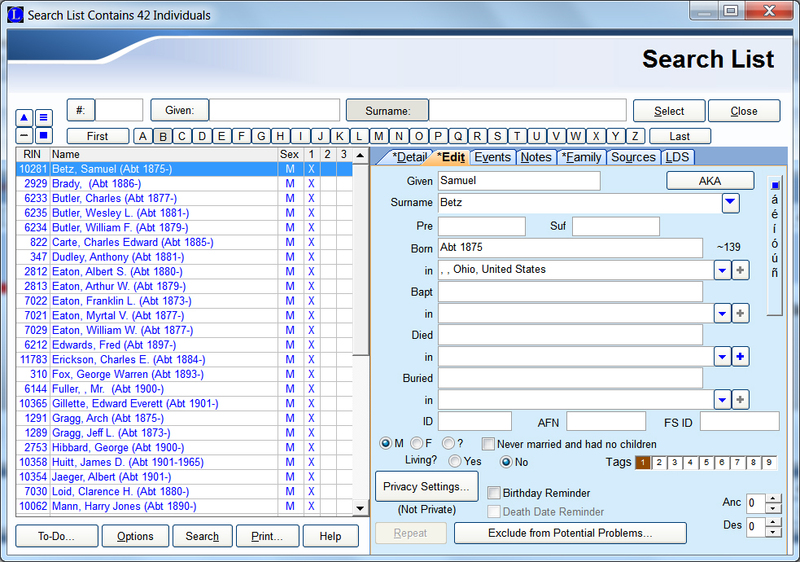 The searches can be saved and reloaded for reuse. This How-To article is meant as a supplement to the Legacy Help file. If you have additional questions, click the Help button in the Detailed Search form. There is also a Webinar on Dates, searching, and tagging that you can watch free at http://www.familytreewebinars.com/video-detail.php?video_id=18. To open the Detail Search form click on Search > Find. Next select the Detailed Search tab. The Detailed Search for allows you to search by conditions: Primary Condition, Second Condition and Third Condition. Each of these conditions has fuor criteria (fields) that you can specify: Look for Whom?, Where to Look, How To Look, and What To Look For. Select the type of person you want to find. You can search for an Individual, a Male, a Female, or a Marriage. You can look in a number of fields for the information. Click in the Where to Look field for the drop-drown list or click the Help button. You can search by using Equal To, Not Equal To, Before, After, Contains, Starts With, Wildcard and more. (Depending on the kind of search, some searches do not include all the available methods.) None of the searches are case sensitive; upper and lower case letters always match. Type in the information you want to find, or, for some searches like Tags or Child Statuses, select the item from the drop-down list box. If you want to search for blank fields, don't enter anything in this field. 2. Notice that the How to Look field is set for Contains and that the What to look for field has Ohio only. If you set the How to Look field is set at Equal To only people with exactly Ohio (no more; no less) as a burial place would be found. 3. Next, in the lower left corner of the Detailed Search form, select Clear List before this search and then click Create List. 4. A Search List displaying 17 people matching the selected criteria will open (keep in mind this is an example using a different file than yours). 1. 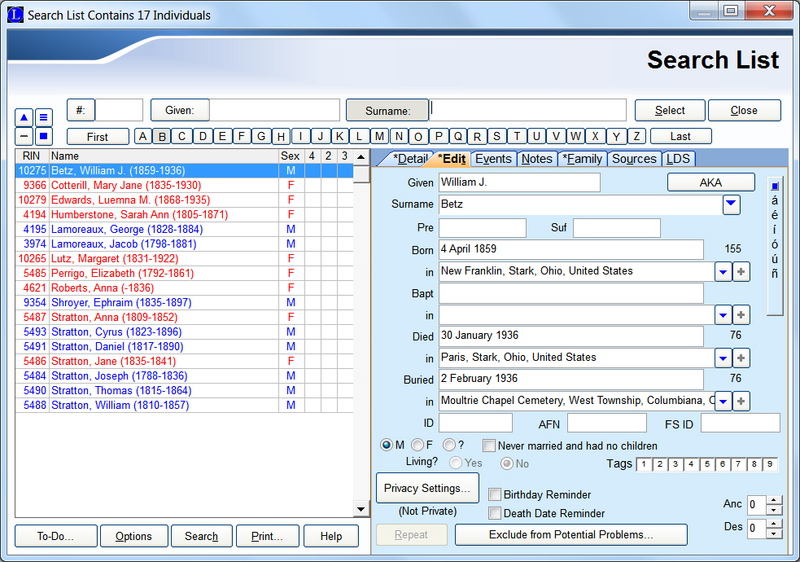 Suppose you realize you need to expand your search to include people who either died in or were buried in Ohio. There has to be more than 17 people. You need to add a Second Condition. 2. Now create the list just like before. 3. The Search List displaying 77 people matching the selected criteria will open. 5. If you like this Detailed Search, you can save the search criteria for another time. At the bottom of the Detailed Search form, click the Save button, then give the search criteria file a name and click Save button in the lower right corner of the Save Search Criteria window. 6. To reload the saved file, click the Load button at the bottom of the Detailed Search form, select the file and click Open button in the lower right corner. Once reloaded, you can easily change the What to look for field. Remember that the How to look field should be Contains. 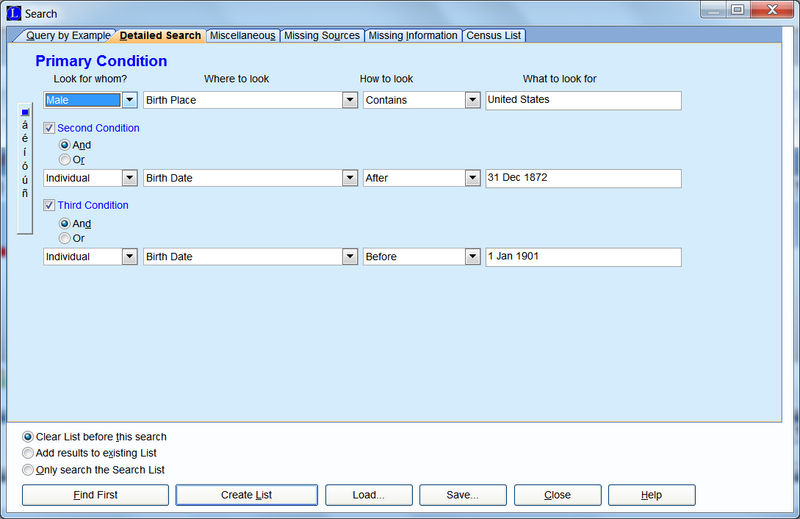 The following demonstration is for a World War I Draft Registration Search and shows how a search using three conditions is done. In the United States, three draft registrations were done between 1917 and 1918. The first was held 5 Jun 1917 for men ages 21-31. The second was held 5 Jun 1918 for men who turned 21 since the 1st registration. The third started 12 Sep 1918 for men ages 18-45. These registrations have the full birth dates and in some case the birth places. 1. Using the description as criteria, we can set up a Detailed Search with three conditions. 2. The search results in a Search List with 440 draft eligible men born in the United States. 1. Our goal is to find the men that have inexact "Abt" birth years so we can then research for their full birth dates in the online World War I Draft Registration databases at Ancestry.com or FamilySearch.org. Now we need to do a fourth search using the Search List we just created, so we select Only Search the Search List in the lower left corner. 4. Next we must add a new Primary Condition. 5. 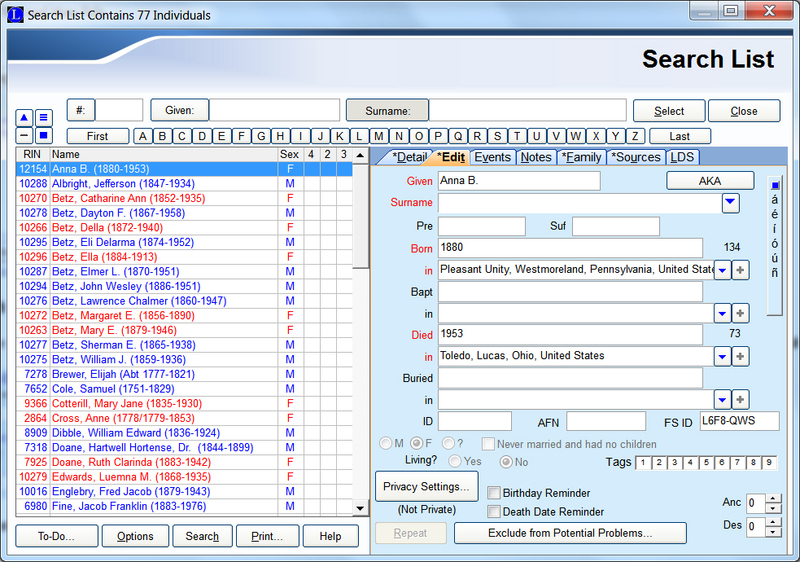 We create the Search List, which contains 42 men with inexact "Abt" birth years. 6. 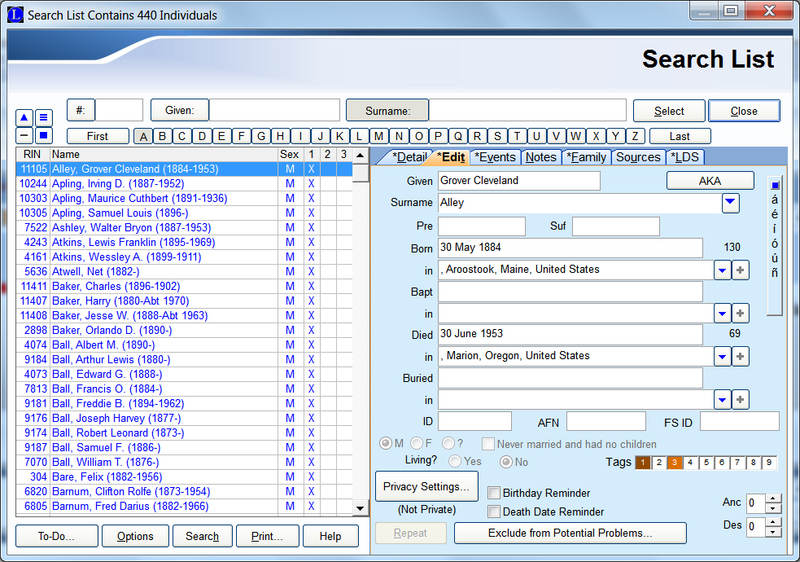 Using this Search List we can now search the online World War I Draft Registration databases at Ancestry.com or FamilySearch.org.